Abby the Librarian: Nominate Debuts for the Morris Award! 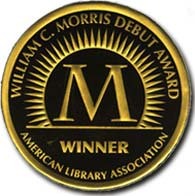 Do you know about the William C. Morris YA Debut Author Award? This is a relatively new award (started 2009) given by the American Library Association each year to a debut author writing for young adults. I know many of my bloggity friends are participating in the 2011 Debut Author Challenge, hosted by Kristi at The Story Siren. As you're reading those debuts, consider nominating the best of the best for the Morris Award. Field nominations are accepted through December 1 each year. 1. Check out the criteria for the award first. 2. Books must be published between January 1, 2011 and December 31, 2011 to be eligible for this year's award (which will be announced at the ALA Midwinter Conference in January 2012). 3. To be eligible for the award, the book must be the author's first published book for any audience. 4. Only books written/published for a YA audience (defined as ages 12-18) will be considered. Since publishers/authors/editors may not nominate their own titles, field nominations are important to ensure that the best books are being brought to the attention of the committee! So, check out the criteria and, as you're reading these fabulous 2011 debuts, don't forget to nominate the best for the Morris Award!